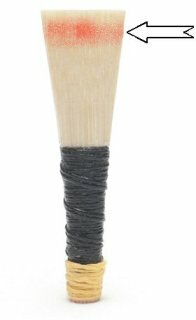 When removing cane from a chanter reed always remove very small amounts at a time and test it between adjustments, it is very easy to take cane off but you cannot put it back on. 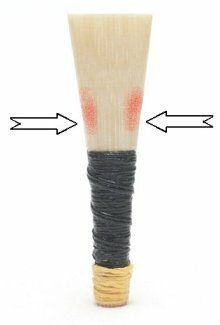 If your reed is too hard and uncomfortable to blow then you can make it easier in the following ways. If it is tight in response then using a sharp blade very gently shave the upper region of the blades remembering to remove the cane evenly across the width of both blades. Be aware that this will also flatten off the top hand notes a little and it may be necessary to sink the reed a little in the chanter to compensate for this. Avoid shaving the lips of the reed. If the response is good, (a slight tightness is desirable for stability) then you can ease it slightly by removing small amounts off the shoulders just above the staple. Remove this evenly on both sides of each blade. Be aware that this will slightly sharpen some of the bottom hand notes, particularly C and D. It will also increase the response but not quite as much as removing cane from the upper region of the blades. Another method often employed is the application of a small elastic dental band, this is very effective and can often help stabilise a reed in its initial blowing in period. Two or three wraps of the band around the sound box will ease a reed considerably; it will also lift the pitch. This band can remain on the reed for the duration of its life. It is effective in raising and lowering the pitch in small increments to assist with tuning, particularly within a pipe band environment. To raise the pitch simply slide the band a little further towards the lips of the reed. To lower the pitch slide it towards the staple. Be aware that if placing the band too high it will muffle the reed too much. To avoid this keep the band within the sound box area. On occasions, this can occur with any reed/ chanter combination and you can fix this easily.Using the dental band, as already mentioned, is very effective. The reed being sunk to far into the chanter, try lifting the reed a fraction. Alternatively using a very sharp blade, cut a hairs width off the top of the blades. This will also raise the pitch and strengthen the reed slightly. Be careful as too much taken off here can dramatically raise the pitch of F, HG and HA, if this occurs then they can be brought back down by thinning the upper region of the blades as explained, but remember this will then weaken the reed also. A number of things can cause this. 1) Insufficient pressure on the reed, just blow a little harder and it will clear. Every reed is different and requires slightly different pressures to obtain optimum sound, learn to get the best from a reed by learning to blow the pressure that suits it. Maintain this pressure at all times or an unsteady bagpipe will result. 2) The bottom of the staple touching the side of the reed seat wall, ensure that this has a wrap of hemp around it. 3) The reed sunk too far in the reed seat lift the reed a little. 4) Lastly if a croak is persistent then rubbing the very tips of the reed blades at right angles across the back of your thumbnail or on a sheet of glass at 45 degrees will clear this. Be careful though as too much will cause a very thin sound to the top hand notes. You can achieve fine-tuning of the chanter with the use of tape applied across the top of the open hole of the note that is sharp. Notes that are persistently flat with a variety of reeds should be undercut. This undercutting should be left in the hands of an experienced player or manufacturer. Fine-tuning with tape is very straightforward and to begin with is a trail and error process. More tape covering the hole = flatter note. See the guide to taping and undercutting for further information.